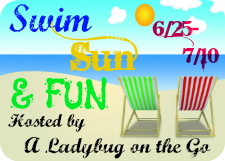 Uplifting Love: Swim, Sun, & Fun Giveaway! "Make Our Own Network" solely organized this event and I received no compensation for this publication. My opinions are 100% my own and may differ from your own or even those stated in this post. Uplifting Love is not responsible for sponsor prize shipment. Thank you for co-hosting the Blog Hop! I am following you via Bloglovin'.